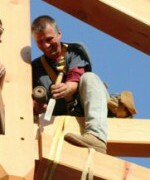 Vermont Timber Works began in 1987 designing and building homes from start to finish as Friant & Kelleher Builders Inc. Since then we have become more and more specialized. Starting in the year 2000, we have focused on timber framing and manufacturing post and beam frames exclusively as a timber frame contractor. As few of our employees are show to the right. We still do residential work, but we also engineer and build timber frames for churches, hotels, barns, welcome centers, state parks, museums and summer camps. Much of our work is highly technical, either spanning distances of up to 80′ with heavy timber trusses, or in small buildings using graceful arches and curves for a highly finished look. All of our timber frames are handcrafted. Everything we do is a team effort, and all of our employees are key in that effort every step of the way. The sales people act as the client’s liaisons, the estimator works with the engineer and designer, and the production team gets it done. Everyone has an open door policy, questions are asked and answered continuously to provide a seamless process and an elegant product. We have stayed away from automation, allowing us to design unique timber frames to meet the individual architectural needs of each building we work on. Our timber frames are shipped as kits for the owner or our crew to assemble. Our buildings have wonderful interior designs with looks that range from rustic to elegant. Whether we are supplying rough hewn ceiling beams or a complete timber frame, we are a “hands on” company. All of our employees participate in various aspects of the process as a team, from design to fabrication and finally to erecting the finished timbers. As of January 2015, our factory has been completely solar, thanks to our new 56kw solar array. Delivery Nationwide in the USA and Canada. Our frames can be shipped anywhere in the world. Our team ranges in size from fifteen to twenty people depending on work load. A few of our employees are featured below. 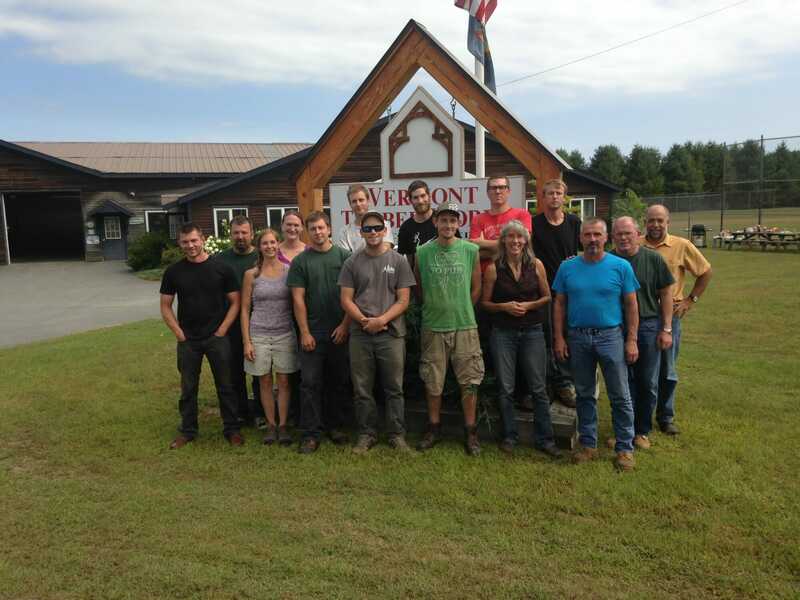 Kellin graduated from the construction program at Springfield High School in 2004 and has been with Vermont Timber Works ever since. He works in the shop and in field and is responsible for cutting the more complicated hip and valley members. He also does layout, shop production management and site supervision. Richard trims a timber for the Chapel for Holy Apostles. Richard had been with VTW since 1989 and has worked in all aspects of construction and timber framing. He is now an estimator and designer. He has a degree in architecture and construction and is fluent in French. Dan installs a custom steel tension plate and Tom Cutler assists. Dan co-founded VTW in 1987 and is responsible for operations, layout and scheduling. He holds a degree in economics from the University of Vermont. Doug climbs staging at the Chapel for Holy Apostles. Doug co-founded the company with Dan Kelleher in 1987 and is responsible for timber frame design, spreadsheets, and web design. He holds a degree in geology from the University of Vermont. Both Dan and Doug enjoy working on and installing VTW’s frames and are still very “hands-on” owners. 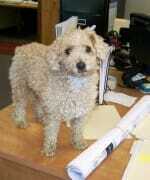 Kramer has been with Vermont Timber Works since 2006. He is highly qualified in cute, but also takes his self-appointed role as ‘security manager’ very seriously. Whether patrolling the shop or the office, he is always happy to stop and accept a good pet.